Founded in 1856, the Island Green Malthouse and Brewery, Wrexham, was a brick-built, double courtyard range with additions/alterations of 1890. 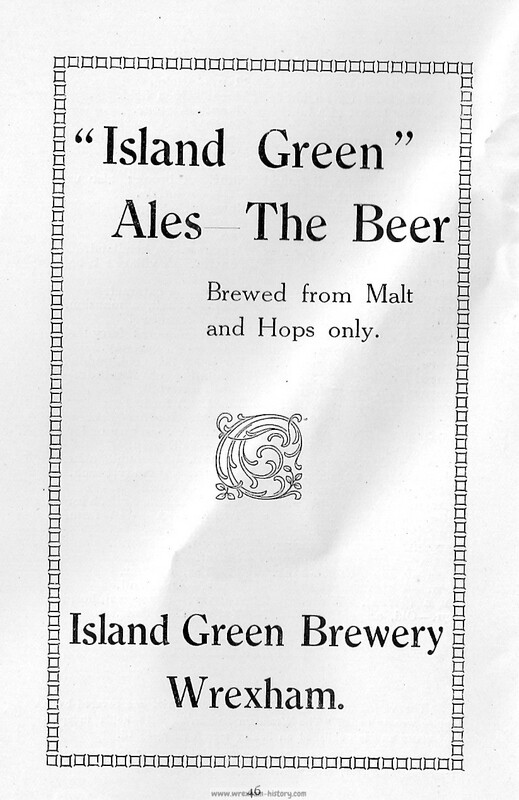 Island Green originally had a 16 quarter brewhouse and 32 quarter maltings. (8 bushels of barley equal one quarter which would produce 150 gallons of beer on average). The brewery was named after the nearby Island Green House, which was eventually demolished in the 1880s. The founders of Island Green Breweries were William Jones (1819-1904) and his brother John Jones (1825-1913). Their parents were William and Maria Jones, of Caia farm (now a pub), in Wrexham. 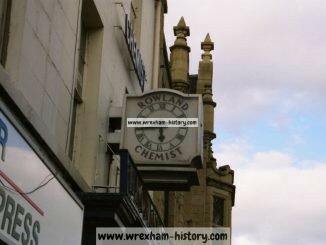 William was articled to Edwin Wyatt, solicitor, and became an auditor to the gas and water companies, Wrexham Savings Bank (in February 1855, he succeeded Mr. Bury, who had become an actuary) and Poor Law Union in Wrexham, and was also clerk to the Maelor justices and tax commissioners at Overton, Flintshire. The Jones brothers were known as pillars of the local community. Their charitable trust paid for half of the Wrexham & East Denbighshire Memorial Hospital after the First World War. One of their early gestures of goodwill unfortunately fell flat when their kind offer of a barrel of ale for the occupants of the local workhouse was rejected. On Thursday, 16th December 1869, at a meeting of the Wrexham Board of Guardians, the Clerk read a letter from Mr. Jones, offering the ale as a Christmas gift. Mr. T. Rowlands, of the Board, was in favour of accepting the kind offer, quoting the Bible passage, “wine maketh glad the heart of man”. Mr. Edward Jones of Ruabon seconded the motion. Mr. Baugh, opposed the proposal, saying that as he could do without ale with his roast beef and plum pudding he didn’t see why the paupers could not do without it as well. Previous canvassing had shown that 127 inmates of the house were against having beer at Christmas and only 53 were desirous of having the drink. The chairman, Captain Panton, R. N., was of the view that the ale should be offered to the 53 inmates who desired it. Mr. Humble drew attention the fact that the greater proportion of those in favour of having the ale were women. The vice-chairman, Mr. Lester, commented that women were indeed becoming more drunken. He drew attention to the fact that a committee appointed to inquire into the causes of vagrancy and pauperism had indeed reported that drinking alcohol was the primary cause. A vote was taken against providing the inmates with ale and it was decided instead to offer an alternative treat and a fund was created with £7 raised to provide a Christmas treat. By November 1873, the Wrexham and Denbighshire Advertiser was focussing on Colonel Jones, the tenant of Hafod y Wern Farm, who was requesting that steps be taken to “reduce the in-take of brook water by the main sewer at Island Green Brewery, as that over-dilution of the sewage, and the excess of sand brought with the water from the brook was very embarrassing” to Colonel Jones. The Surveyor had written to Mr. Jones of Island Green Brewery but received no response. The surface pipes needed re-laying and Mr. Jones had apparently made known his intention to carry out the work. The Town Clerk was asked to write to Mr. Jones. By August 1876, Mr. David Higgins, inspector of nuisances, caused the river to be cleansed from Mr. Hugh Price’s skin-yard up to the Island Green Brewery. As the county authorities were engaged in building a bridge, the portion of river above and below the Green Bridge remained dirty. In November 1877, Mr. David Higgins made an inspection of the river from the Dog Kennel up to Island Green Brewery and aside from finding several drains opening into the river, he found nothing offensive or injurious flowing from them. The floodgate at Mr. Price’s skinyard was still in use but the water dammed back up to Ruabon bridge, causing settlement and fouling the river. A notice had been served to Mr. Charles Bates, the owner of the skinyard and to Mr. Price, the occupier, urging them to discontinue the use of this floodgate. Patient searching of the old newspapers often unearths little glimpses into the everyday lives of the founders of Island Green Brewers and I found that on Saturday, 9th June 1883, Mr. William Jones of Island Green, Wrexham was returning home when he was pitched out of his trap. He was shaken up but unhurt, although the trap was damaged. John Jones and his brother William owned a lot of property; not only in Wrexham but also in the surrounding areas. The Wellington Journal of 11th October 1884 announced that the Black Lion Hotel, Ellesmere, was to let. 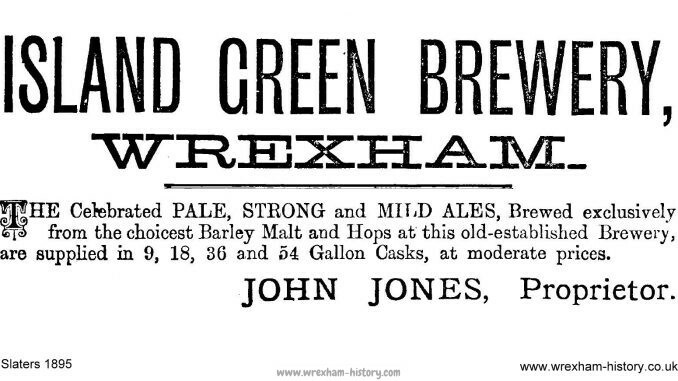 It had “commodious yards, stabling, coach-houses and every convenience for a first-class commercial and local business close to the markets.” Anyone interested was to apply to J. Jones of Island Green Brewery Wrexham. On 5th September 1885, the Wellington Journal carried a Wanted advert in which Mr. J. Jones of Island Green Brewery was seeking an experienced Maltster to work a malthouse where two assistants are employed. Character references and details of qualifications were strictly required. On 7th July 1890, there was a property sale at the Wynnstay Arms Hotel, Wrexham. The valuable freehold property was the Talbot Inn, Rhosllanerchrugog, which was offered for sale by Mr. Frank Lloyd. The Talbot Inn was sold to Mr. Jones, of the Island Green Brewery, Wrexham. On 5th August 1893, the Wellington Journal once again carried an advert from Mr. John Jones, who was seeking a Middle-aged Head Malster for the next season, to work a malthouse with two assistants. Strict references were required for capability and steadiness. This indicates that Mr. Jones took care when choosing staff. On 30th July 1894, William Lee and Thomas Phoenix, two carters employed by Island Green Brewery, caused an obstruction on Bridge Street, Wrexham, by leaving their carts unattended. Police Constable J. Evans was called for and located the two men in a public house. On Tuesday, 28th August, the two men appeared at the Petty Sessions before Lord Trevor, William Coward Esq., and Lloyd Edwards, Esq. They were charged with obstruction and were each fined one shilling and costs. On Wednesday 3rd January 1900, the annual treat to the poor children took place. Among those local businessmen offering their services was Mr. Jones of the Island Green Brewery, who lent the barrels and carted them to the hall (it doesn’t say which hall). Mrs Parkinson made the tea in the Island Green Brewery. Around 1,300 children were enabled to have a good meal and were given as much as they could eat and drink. As they left the hall they were each handed a bag containing a meat pie, mince pie, a piece of cake and an orange. After tea, they were entertained by the Wrexham Christy Minstrels. The Wellington Journal of 13th September 1902 once again carried an advert by Mr. John Jones seeking a middle-aged Head Malster to work a malthouse with two assistants. References were strictly required for capability and steadiness. Maybe Mr. Jones felt that someone middle-aged would be more likely to possess those qualities. On 15th August 1903, Wellington Journal was once again asking on Mr. Jones behalf for a middle-aged Maltster to take charge and work with two assistants operating a 36-quarter kiln during the next season. Apparently Seasonal beers were produced when fresh ingredients were available during various seasons, per climatic conditions during the time of the year, and also as a tradition. References for the position were required for capabilities and steadiness and applications were to be sent to Mr. Jones along with details of age and experience. Following William’s death in 1904, John Jones became one of the town’s greatest benefactors. In addition to the hospital trust, he made many other donations to worthy causes, which included paying for the construction of St John’s Church in Hightown and the William & John Jones Recreation Ground in Rhosddu (still extant). John lived at Grove Lodge, Wrexham and was liberal in his gifts to the Church and hospitals in Wrexham and to the parishioners of Wrexham and Rhosddu. An important sale took place on Thursday, 12th October 1905 at the Property Mart, 6 Temple Row West, Birmingham at three o’clock in the afternoon precisely. The auctioneer and brewery valuer was Mr. J. W. Florance. The property to be offered included the well-known Island Green Brewery, Wrexham. This freehold brewery consisted of a well-arranged sixteen-quarter plant, fifty-four-quarter maltings, stores, stabling, cottages, land, &c. These were to be offered together with twenty-one freehold licensed houses and other properties, including one leasehold licensed house, which produced together rentals amounting to about £1,435 per annum. The licensed premises were all within easy road delivery distance of the brewery, the reasons for the sale were given as the winding up of an estate and the advancing years of Mr. Jones, of Grove Lodge, Wrexham, the surviving owner. Six of the licensed houses for sale were in Wrexham with the other fifteen being in what is now known as Wrexham District. The Times of 13th October announced that the entire lot of houses and the brewery had been sold to Mr. Francis Osmond Joseph Huntley, of Boxwell Court, Wotton-under-Edge, Gloucestershire for the sum of £73,600. Elsewhere I found a reference to the brewery being taken over by Huntley & Mowat, so Joseph Huntley must have had a business partner. John Jones, co-founder of the Island Green Brewery died in 1913. On Tuesday 28th August 1917, at a meeting of the Denbighshire Appeal Tribunal at Wrexham, Mr. G. Mowat, owner of Island Green Brewery, Wrexham, appealed on behalf of his employee, Ernest Jones, aged 49, of Norman Road, Wrexham, that in the national interest it was expedient for him to continue in his present employment as brewer and manager of Island Green Brewery. Mr. Mowat expressed the view that, “Beer is a necessary element in the diet of colliers, munition workers and others engaged in hard manual labour and is therefore of national importance, and this has recently been emphasised by the Government allowing an increase in its production.” Without expressing their opinions, the tribunal concentrated on the physical condition of the man for whom exemption from service was asked. In view of the fact that he had previously been rejected and was now B1 it was decided to send him to the medical board for re-examination. On September 18th, 1917 Ernest Jones was the subject of an appeal for further exemption at the East Denbighshire Appeal Tribunal at Wrexham. Mr. Ll. Hugh Jones, on behalf of the man’s employers, Messrs Huntley and Mowatt. 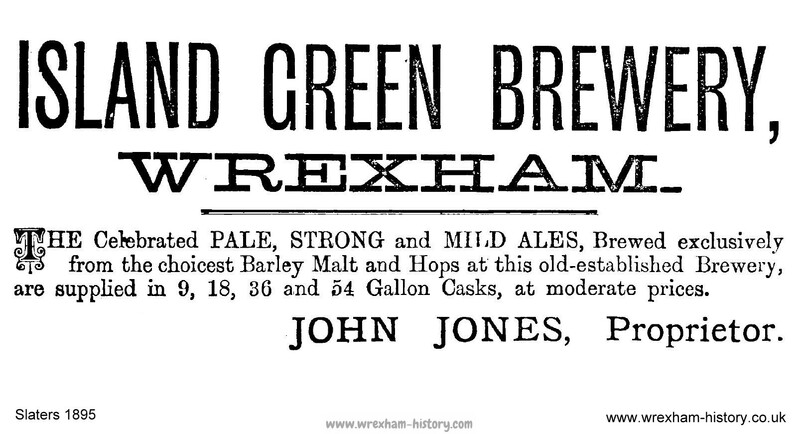 Island Green Brewery, Wrexham, produced evidence to show that Jones was the only responsible man left at the brewery excepting Mr. Mowatt and that he was in sole charge of the manufacture and maintenance of the plant. A capital of £100,000 was invested in the concern. Mr Jones was in full control and responsible for the malting and the brewing. Mr. Ll. Hugh Jones submitted that beer was an element that entered into the necessary food of the collier. 80% of the proceeds went into the National Exchequer. The Chairman, Mr. Christmas Jones, suggested that beer was like liquid bread but Lieutenant Cyril Jones (military representative) retorted, “More useful as solid bread”. Exemption was granted until 31st December. As a footnote to this account, it is of interest that journalism was no more accurate in those days than it is today. The Llangollen Advertiser of 31st August 1917 described Mr. Ernest Jones as being 49 years of age, but according to the Liverpool Daily Post of 19th September, Ernest Jones was a 38-year-old father of three children. In 1927 Island Green Brewery purchased the Union Brewery. In 1931 Island Green Brewery merged with Soames Brewery of Wrexham and Dorsett Owen of Oswestry to form Border Breweries. Production was centralised at the Tuttle Street site and brewing ceased on the Island Green site shortly afterwards. The old Island Green brewery buildings became a warehouse, said by some to be haunted by John Jones, who was probably none too pleased at the fate of his business. By 1937 the buildings were being used as a creamery. 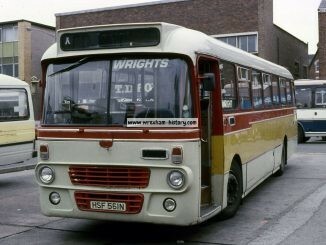 In the 1970s the site closed down and fell into dereliction. In the late 1990s, Wrexham Central Station and part of the Island Green Brewery was developed as Island Green shopping park. In February 1998, the Contracting Section of the Clwyd-Powys Archaeological Trust conducted a photographic survey of the old brewery. The buildings were all found to be built of red brick, with dentil eaves and some stone mouldings and detail present. The southern group of buildings comprising the maltings consisted of two square plan malt kilns, with ornamental scalloped slate roofs, to the east-south-east of a three-storied range. The range to the west-north-west of the kilns had a brick exterior built on a dressed stone base. The internal beams carrying the first floor were supported by cast iron columns manufactured by Cheetham & Chadwick, Eagle Foundry, Wrexham. Vaulted cellars discovered beneath the ground floor of the range, consisted of a series of lateral compartments divided by brick partitions, running off a central passageway. The range to the west-north-west of the kilns was linked to the main brewery buildings by a brick archway, giving access to the rear courtyard. On the north-north-east side of that archway was a two-storeyed range in two parts. The east south-east part of the range was the original section, but a subsequent addition to the range had been constructed on its west-north-west side, presumably in the late 19th or early 20th centuries. Beneath the ground floor of the addition to the range was a cellar which contained bottle-washing machinery and electricity distribution equipment. Elevators in the interior of the addition appeared to have been used to transport crated bottles between different floors. The interior of the original part of the range had a stone flagged internal floor at ground level, with four arched openings in the east-south-east elevation of the range. The arches were supported by dressed stone springers resting on cast iron columns, each of which rested on a stone base. The first floor was based on horizontal beams supported by vertical cast iron beams of angular cross-section. The main brewing tower adjoined the two-storeyed range on its north-north-east side. Internally, the tower was formed on a girder framework supported by cast iron columns manufactured by John Melboume, Engineers, Warrington. The ground floor room of the tower contained a fireplace, presumably used in the brewing process, which was ventilated by a stone-capped chimney on the north-north-east side of the tower. On the north-north-east side of the main brewing tower there was a secondary range, also likely to have been used in the brewing process. A fireplace on the west-north-west side of the range appeared to have served one of two internal brewing vats. Internal cast iron supporting columns were manufactured by John Melbourne, Engineers, Warrington. On the west-north-west side of the brewing tower and secondary range stood an additional range of buildings. Included in these buildings were lean-to structures adjoining the brewing tower which had been used to house machinery. Following demolition of the structures a probable flue, constructed from firebricks, was revealed which was most likely used in the brewing process and may have been an original feature. The range located on the east-south-east side of the brewing tower at the time of the initial survey was of later construction than the main brewery buildings and appeared to be of late 19th or early 20th century date. The south-south-west part of the cellars beneath the building had been used for storage while the north-north-east part contained a well with an electric water pump; cast iron supports within the north-north-east part were manufactured by Powell Bros. & Whitaker, Wrexham. There had been an earlier building in this area; the walls of the cellars were of dressed stone with a lining of brick. A dressed stone springer located at the southern corner of the brewing tower had been designed to serve a building on the east-south-east side of the tower in addition to the surviving arched range located on the south-south-west side of the tower. This earlier building was probably the one depicted on the 1st edition Ordnance Survey map of 1872. The Western boundary of the brewery complex was defined by the former stable block. An internal stone stairway was recorded. On the south-south-west side of the stable block stood a group of fairly recent structures, including a brick-built block, part of which had been used as toilets. The dressed stone wall adjoining the toilet block may have been part of the original brewery boundary wall. Two interesting artefacts were recovered by the on-site staff during the watching brief, which may shed further light on earlier phases of the brewery. A large stone slab with a central hole was reported to have acted as the capstone for a well located to the west of the brewing tower, though the weIl itself was not visible during the site visits undertaken as part of the watching brief and it is therefore impossible to ascertain its relationship with the brewery complex. In addition to the above artefact, a cast iron drain or sump was found near the brewing tower. No makers name was present, but it seems possible that the artefact belonged to an early phase of the brewery. The remaining brewery buildings have since been restored by RIBA, the Chartered Institute of Architectural Technologists. They have been tastefully converted to contain 34 town centre apartments. The southern outer courtyard includes a 3-storey malting range and twin kilns with brewery buildings to the west and north. A pair of brewing towers are sited at the NW corner between the north cellar range and west former loading bay range. An archway in this range provides access to a rear courtyard and stable range. WRITTEN BY: Dave Edwards – August 2017. 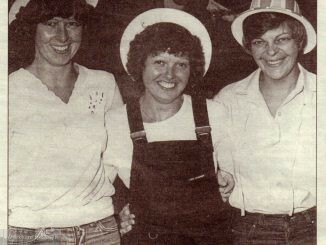 Coed Aben, Wrexham, street party 1981. Source: NWN Media.